The success of the Washington Apple Commission in exporting US-grown apples to India showed it was possible to market premium fruit in India, agricultural economist and consultant Keith Sunderlal said. Keith Sunderlal and Allen Jenkin at the Citrus Market Outlook Forum 2018. Keith established The SCS Group in the late 1980s as head of the agricultural commercialisation and enterprise project funded by the US in India. His prime focus is marketing premium foods to the Indian middle class. The SCS Group has worked on the campaign for Washington Apples in India since 2003. He said India’s large and growing population, large middle class and fast-growing economy made it a market full of potential for premium Australian citrus. Keith said the success of the US in exporting premium apples to India, despite a 50 per cent tariff, highlighted a path Australian citrus could consider taking into the marketplace. He said apple shipments to India started around 1999 and some of the earliest shipments were from Australia. “It died out after five years – didn’t really grow much for Australia – but it became a tremendous success story for the US,” Keith said. Today India is the third-largest market for US apple exports after Mexico and Canada. “They ship over 100,000 tons (90,700 tonnes) of apples to India. They’re the most expensive apples coming into India. We have apples coming all the way from Iran [and] Turkey, Oman [and] China, and European producers, Chile, all over the world, New Zealand as well. Keith said despite India producing two million tons (1.8 million tonnes) of apples domestically each year, the US ships apples 52 weeks of the year to India. He said product position and differentiation were key to the ‘Washington Apples’ success in India. “I know Red Delicious isn’t one of the best apples and a lot of you wouldn’t even thinking about eating it,” Keith said. He said the “thick-skinned, humble Red Delicious apple” better withstood the high temperatures and humidity of the Indian summer, when the biggest shipments were made. “Its unique shape, its unique product, has been a great help,” Keith said. He said they were some of the first fruit to be marketed with a branded sticker, which signified to customers it was a premium product. Less than 20pc of even premium food is sold by modern retailers in India so for any large-sale campaign to succeed it needed to include wholesale markets, wet markets and smaller cities and towns, he said. “Last season we conducted direct consumer- and retailer- and wholesale market-level contact programs in 89 cities in India,” Keith said. He said India produced 12 million tons (10.9 million tonnes) of citrus but harvest was over only a few months and cold storage conditions were quite challenged. “So it does present an opportunity for a lot of citrus to be imported,” Keith said. He said India was importing about 55,000–60,000 tons (49,900–54,400t) of oranges in total. Mandarin imports were new, Keith said, but last year Australia “did some good shipments of mandarins into India”. He said for Australia’s market share of citrus sold in India to increase, the industry had to target the middle and upper class and develop a strong brand. In Keith’s experience, partnerships were vital to the success of Washington Apples in India. And his last tip was to persevere. “India is not an easy place to do business. It might take you a little bit of effort to get in and to understand how to do things, who the initial partners are, where do you want to sell, what your terms are going to be and things like that. 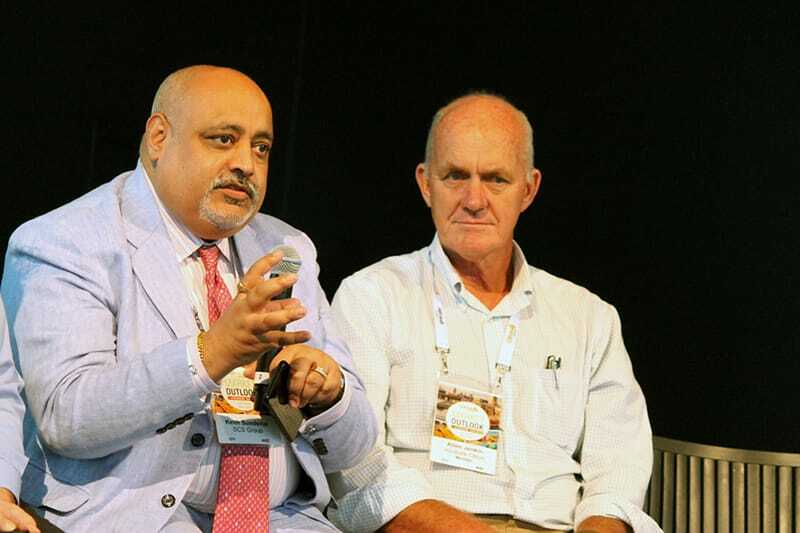 David Daniels, Citrus Australia’s Market Access Manager, said there had also been thinking in Australia that India was a lower-value market so more fruit tended to be sent there when there was a big crop of small fruit. But David said exploring options to develop another high-value market for Australian citrus could benefit the industry. Keith said the opportunity was enormous is India. “You cannot think of it as a dump-off market – when the US started in India, that’s how it started, too, but we convinced them there was an opportunity,” Keith said. “The time for Australian citrus is now. It’s today; it’s not three years from today. “If you don’t position your product right in the Indian market, I guarantee you that you will never set it in the Indian market,” he said. “I think internationally there is a checklist when people think of a foreign market: what’s the quarantine situation, what’s the tariff, what’s the income, and if it’s X, X, X [it’s considered a] useless market.